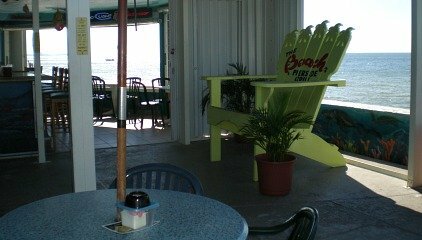 Ft Myers Beaches are so close to Cape Coral and go from party scene, to fun for families, to aaaahhhhh ........ quiet and relaxing. It's only 30-45 minutes to get to the beaches, depending on where you live in the Cape. Fort Myers Beach is actually on an island which you access by bridge and is separate from Fort Myers. Traffic can back up on the bridge, so it may take longer particularly if it's spring break, the weekend, or after 11AM. 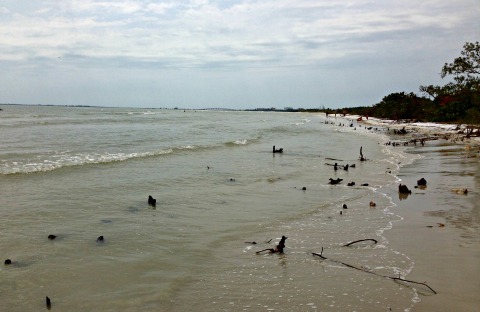 Bunche Beach is over near the Sanibel Causeway and is a more wild beach, perfect for nature lovers. 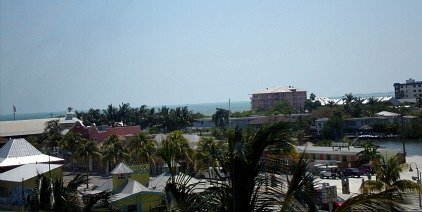 As soon as you go over the bridge from Fort Myers onto the island of Fort Myers Beach, you'll see the main downtown section with lots of shops, restaurants, and parking. Immediately off the bridge, bear to the right down Estero Blvd and then either turn left into the parking lot in front of the beach and next to Times Square, or you can turn right to park at one of several lots down Old San Carlos Blvd. If you get there early enough in the morning you can save if you stay at the beach most of the day, and the further you park from the beach, the less you'll pay. Some of the parking lots have self-serve machines that take cash or credit cards, and you pay $2 an hour, or you can park in lots with set charges for the day that may go up or down throughout the day, depending on how busy it gets. I got there once at 10:30AM and paid only $6 for the day, and I noticed later that it had increased to $8 for the day when I left at 4PM. Teens and twenty-somethings like this part of the beach because of all the action. 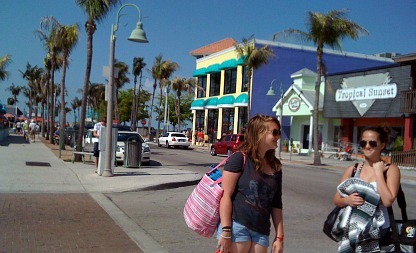 This is where the pier is and the Lani Kai - a hotel popular with spring-breakers - and if you're looking for things to do in Ft Myers Beach ........ most of the beach shops, motels, hotels, vacation rentals, restaurants, cafes, and bars. 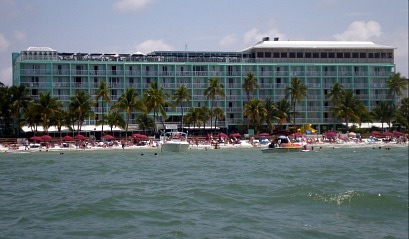 Come by boat and dock it in the water in front of the Lani Kai for a swim, relaxation, or parties with other boaters. 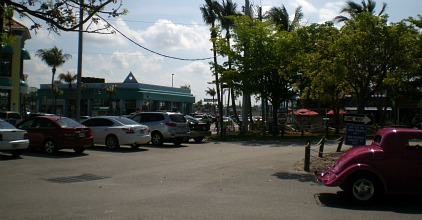 Public bathrooms are available near the pier. 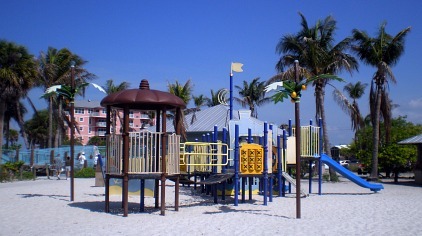 There is also a playground for your little ones to enjoy. We also like to go to the northern tip of the island to Bowditch Point, where one of my favorite Southwest Florida beaches is. At this beach, you have access to public bathrooms, snack shop, and grills. It's less crowded, quieter, there's lots of white sand, and plenty of room for a game of frisbee or tug-of-war. The parking lot is small, so you need to get there really early, say by 10AM, to get a spot ......... or wait and see if you get lucky. You pay $2 an hour through the same self-service machines that are at the other beaches. Another option for Ft Myers beaches is to try to park in the beach access lanes that go off of Estero Blvd, the main street that goes from one end of the island to the other. We haven't had too much success with that, but the one time I found beach access parking was about a mile south of the pier. The beach was so nice, not crowded at all, and we didn't have to pay for parking, however, there are no public bathrooms. There are so many fun things to do, you can go jet skiing or kite-boarding, which you can see in the video below. Resorts and hotels dot Estero Blvd and some of them offer parasailing ......... it's easy and fun, not scary at all! We saw turtles and stingrays way off of the shore from way up in the sky. If you go to the beach between May and October, you need to know about the stingray shuffle. Even though they are there all year round, they become more prevalent when the weather gets warmer. By shuffling into the water, your foot goes under any stingray that might be there rather than stepping on them and getting stung. If you are stung, clean the wound and apply heat ....... go to a doctor if you can't get the barb out. But don't worry about it, we've never been stung. If you want to see a another video of a stingray, go to my Lovers Key Beach page. We've also found sand dollars by digging our feet into the sand while we're in the water. 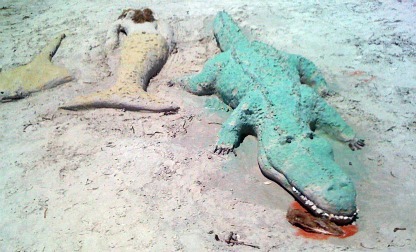 And then there are the sand critters ........! 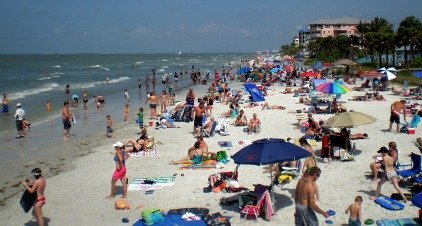 Ft Myers isn't a shell beach, but you will find the turquoise waters, sugar sand, and fun atmosphere to be all you need for a great day at the beach! While you're catching sun and fun at any of the Ft Myers beaches, you'll want to go to Heavenly Biscuit for their wonderful biscuit sandwiches and cinnamon rolls! If you're in the area the end of November, go to the Sand Sculpture Contest, held at one of the hotels at the southern end of the beach. 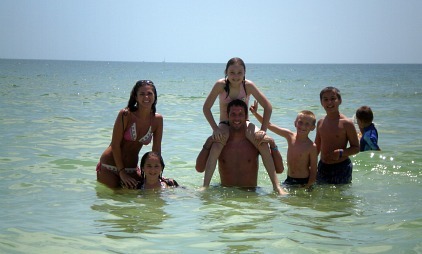 One of my favorite places to stay on Ft Myers Beach is the Pink Shell Resort. It's right on the beach, has terrific views, fine dining, pool, spa, and other amenities! 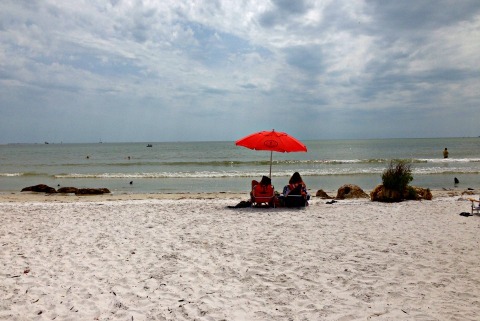 If you want to go to a more natural beach, there's Bunche Beach located between Ft Myers Beach Island and the Sanibel Causeway. To get there, take Summerlin towards Sanibel and then take a left on John Morris Rd and follow it to the end. Pay at the pay stations close to beach and then park on the side of the road where white sugar sand awaits you! It's a great place to suntan and swim, to picnic at tables or your blanket, take a walk, go shelling, and watch for dolphins or the sunset. 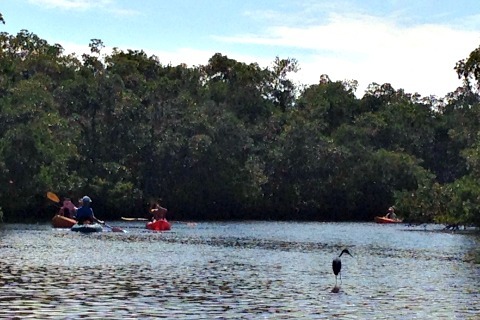 It's also great spot to go kayaking. 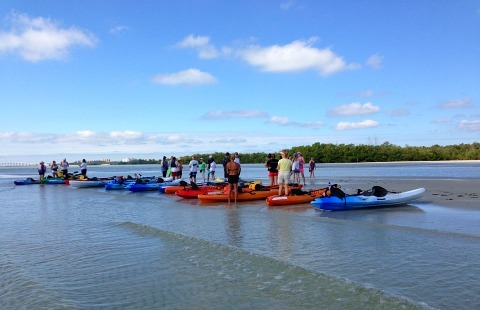 Either rent or bring your own, you can paddle through the mangroves or head out to the beach. We went on a beautiful day in February ....... it was sunny, warm, with low humidity, and the water was absolutely sparkling. 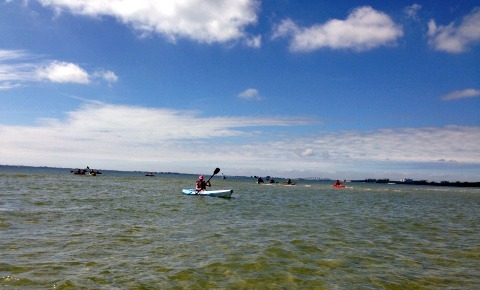 We paddled to a sandbar close to shore, had some lunch, and go shell hunting. I found lots of fabulous shells! The kayak rental is just before the beach, on the right. We rented a kayak for 2, for $45 for 2 hours.